Immigrant parents had a tough choice last fall: stay on the sidelines, or vote in the school board election to make their voices heard, even if it meant risking exposure to federal immigration enforcement. Advocacy groups thought a novel effort to encourage participation in civic life by local noncitizens was a good step forward, but the ferocity of the conservative backlash and the real fear among potential voters resulted in low participation and a continued search for other solutions. One parent, Clara, who is undocumented and requested that we not publish her full name because she fears deportation, knew she wanted to get involved when she heard about a new San Francisco law giving certain noncitizens, including those without legal status, the right to vote in school board elections. But her desire to inform the community about the implications of Proposition N, which San Francisco voters passed in 2016, was rooted as much in concern and fear as the opportunity for immigrants to make their voices heard in local elections. As part of the grassroots movement to make eligible voters aware of the law for the 2018 election, Clara knew that many of them, like herself, were scared of exposing their status to the federal government. Though she has three kids — a first-grade son, sixth-grade daughter and 12th-grade son — in the San Francisco Unified School District (SFUSD), Clara herself didn’t vote. She said she was too scared. But she did make sure to tell her family members who are U.S. citizens to vote not just for the school board but to participate in the entire election. Her brother-in-law and two of her nieces voted for the first time because of her enthusiasm and her political outreach. In total, 65 noncitizens registered to vote in the school district election, a sliver of the number officials and advocates guessed were eligible. Of those who registered, 59 voted either by mail, at City Hall or at their local polling station. Only those noncitizens who had a direct connection to the school district as parents or guardians were eligible to vote. English-language learners make up 28 percent of the student population at SFUSD, according to the California Department of Education, an indicator of the high percentage of immigrant residents in the city. An estimated 35,000 people without legal status live in San Francisco, according to a 2017 Pew Research report. The noncitizen residents — who hail from countries around the world like Mexico, China and Eritrea — work, play, eat and send their kids to school just like everyone else. But their ability to influence the elected leaders of their community and impact the place that has become their home is limited. Proposition N was heralded as a way to improve their participation in civic life, but it was not without controversy. The measure itself passed with 54 percent of the vote, but it also triggered a torrent of criticism from conservatives who thought it was an attack on the value of citizenship, the usual threshold to empower residents to become voters. The resolution has no impact on local voting laws, but it did voice concerns from conservatives. The results of the November 2016 presidential election led immigrant-advocacy groups to worry about negative consequences for voters. Clara and other activists believe their fears about the potential of the new law to expose noncitizens’ legal status were well-founded. When registering to vote, noncitizens are included in a separate database with their names and addresses, according to John Arntz, director of the San Francisco Department of Elections. This database is publicly available. Arntz did not hear of any action taken at the polling stations or any federal inquiries into the voting registry, but during the meetings he held with advocacy groups, district officials and parents, he heard about fears that the federal government could use it to target immigrant families. Still, the grassroots organizations that Clara worked with, such as Mission Graduates and the Central American Resource Center (CARECEN), saw the passage of Proposition N as a big step in expanding voting rights. The two organizations were part of a larger collaborative coalition that spearheaded the information campaign. The Immigrant Parent Voting Collaborative (IPVC) consists of seven grassroots organizations in San Francisco. 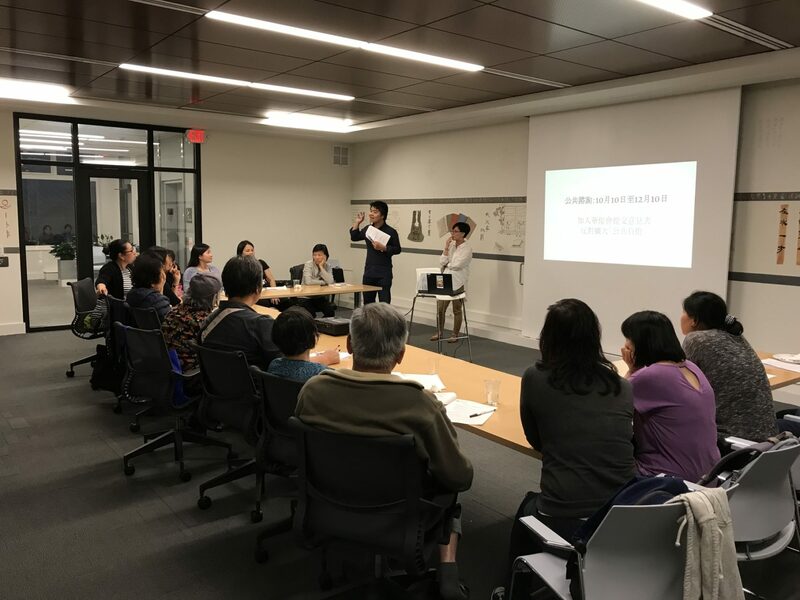 Chinese for Affirmative Action (CAA), a group that advocates for civil rights for Chinese Americans, formed the collaborative as a way to partner with multi-racial, multilingual groups and reach as many parents in the African, Central and South American and Chinese immigrant communities as possible. The collaborative was formed in 2017 to educate and attempt to boost civic participation among immigrant communities in San Francisco, according to Hong Mei Pang, director of advocacy for CAA. It consists of the African Advocacy Network, CARECEN, CAA, Coleman Advocates for Children and Youth, La Raza Community Resource Center, Mission Economic Development and Mission Graduates. The groups held workshops, led trainings, and created brochures and other material in six languages. They estimate that they were able to reach more than 60,000 potential voters in San Francisco. The outreach consisted of workshops and forums that taught parents not only how to register to vote but where they could talk about the importance of voting as a conduit to affecting their child’s education. “Our work at that moment was to educate the community of these new rights that they had, to inform them of the risks associated with participating in the elections, and to refer community members to the vast networks of safety nets that exist,” Pang said. Noncitizen voting is not new in the United States. From 1776 to 1926, 40 states allowed immigrants to vote in local and regional elections. Some were even allowed to hold office, according to Ron Hayduk, a professor at San Francisco State University and an expert on noncitizen voting. “That practice affirms status as legitimate stakeholders, and strengthens connections with their country,” Hayduk said at a news conference March 1 to update the public on the collaborative’s efforts and celebrate the passage of Proposition N.
Noncitizen voting disappeared for several years until New York became the first state to again implement it as part of the civil rights movement in 1968. Since then, several municipalities have begun allowing noncitizens to vote in local elections. A few Maryland cities, including Hyattsville and Takoma Park, allow noncitizens to vote in all city elections. Noncitizen residents in Takoma Park have been voting in city elections since 1992. In Hyattsville, the resolution no longer making U.S. citizenship a requirement to vote in city elections passed unanimously. Nevertheless, few registered to vote. Only 33 noncitizens registered in May 2017, and 12 actually voted. In Massachusetts, Amherst and Cambridge have passed resolutions in support of it, though they can’t go into effect until the state passes its own legislation. Reaching a large swath of people in the city with information about community resources is, to Pang, more indicative of the success of Proposition N than the number who actually registered and voted. The IPVC worked with community-based organizations and other immigrant rights networks to conduct community education workshops and events to support immigrant families in understanding eligibility criteria and their voting and immigrant rights. They held these workshops at school sites and community spaces throughout the city, and also provided immigrant legal screenings and referrals in the ramp-up from July to November. 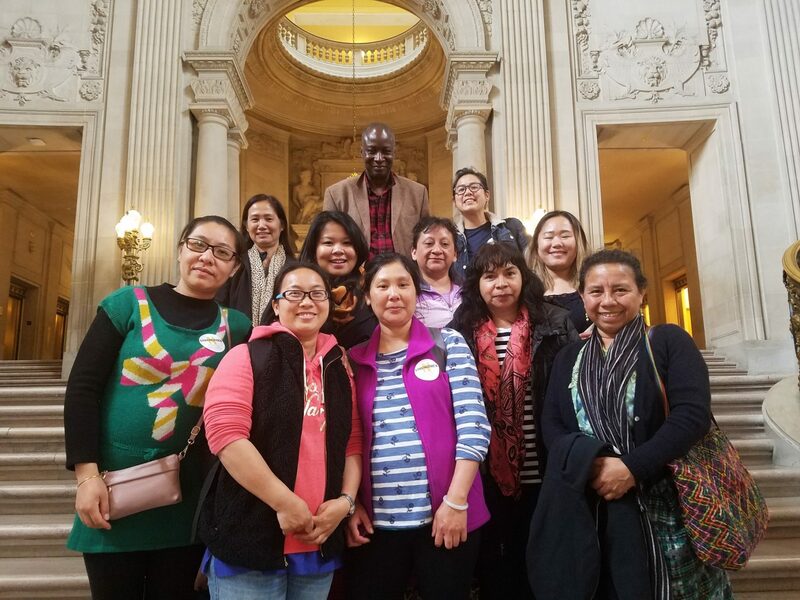 The education and outreach workshops consist of presentations on the rights, risks and protections available to immigrant parents in San Francisco, said Pang. A key goal of the outreach efforts was to highlight the importance of community engagement, civic participation and accessing key services that can improve and facilitate social mobility and political awareness within the immigrant community. The IPVC also partnered with SFUSD to provide linguistically and culturally appropriate brochures and materials during the back-to-school season. 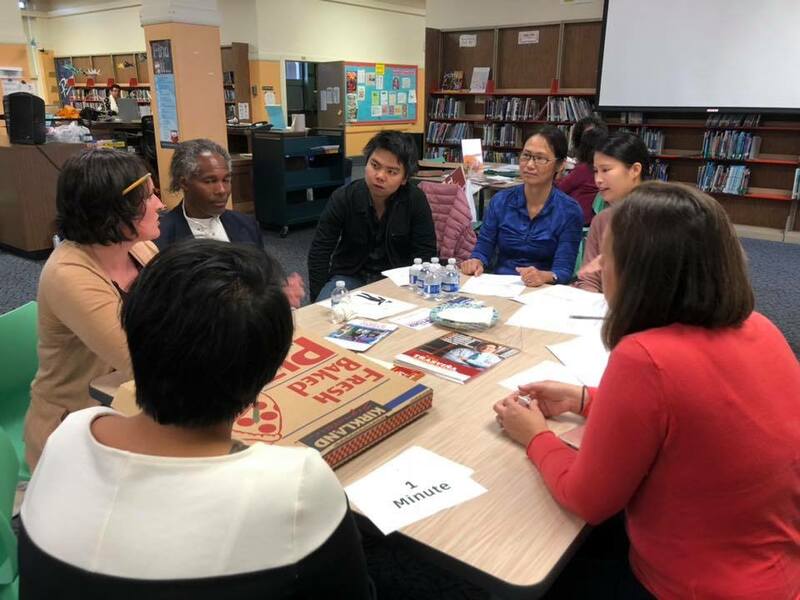 The collaborative conducted various community candidate forums where newly enfranchised immigrant parents were able to directly engage candidates running for SFUSD school board on a variety of pressing issues such as school safety, health and wellness, parent engagement and language pathways, among others, said Pang. The ordinance and the work behind its implementation is just the first step in elevating the voices of those in immigrant communities, she said. “Parents really want to make sure it goes beyond just a vote, that it’s more than just a token of representation,” Pang said. Pang said the Trump administration’s immigration crackdown is the reason more people did not go to the polls on Election Day. But with another school election coming up in November, advocates hope more voters will feel comfortable participating. “When the climate clears, there’s a huge contingent of constituents who are ready to engage in the voting system,” Pang said. Pang is already noticing the effects of Proposition N on immigrant parents and guardians. She notes that since the outreach efforts began, many of the parents the IPVC engaged are now able to leverage the experience and knowledge they gained to “deepen their civic footprint in San Francisco,” she said. They feel more included in their communities and have learned to participate in their schools’ Parent Teacher Associations and English Language Advisory Councils, as well as communicate with their newly elected school board members. “Noncitizen voting has opened up political possibilities for historically disenfranchised families through grassroots organizing, strengthening access to services, and advocating for systemic change as building blocks for civic power within the immigrant community,” Pang wrote in an email. Ultimately, Pang hopes their efforts will assuage some of the fears that immigrant families live with daily and connect them directly with their communities. The fear that prevented many immigrants from voting was tangible for Clara. She felt it every time she went to speak with parents and families. “The fear is real and true in every way. Whatever you hear — police, your name — you’re always thinking, ‘Do I say the truth?’ ‘Do I talk?’” she said. It was also an issue that the Department of Elections had no real control over. Arentz explained that Proposition N simply changed the definition of a voter specifically for school elections. It did not change the rules around voter registration or record retention, which requires that records be available to the general public and never destroyed. “If a government agency requests registration information for a government purpose, state elections law compels the department to provide that information,” Arntz said. The collaborative worked with the Department of Elections to provide safeguards and resources throughout the voting process. This included a notice on the ballot itself alerting voters of the risk, a separate ballot and roster for noncitizen voters to prevent them from voting in a non-school election, and trained poll workers. Poll workers also refrained from referring to them as noncitizens at polling stations to protect their privacy. Instead, they were called EDU voters, in reference to education, because they were voting only for the school board. Aside from these provisions, Arntz and the poll workers made sure that they were treated the same as any other voter that day, he said. For Clara, the fear remains. She said she won’t feel comfortable voting in elections until she sees more protections implemented for immigrants.